78113 RA5366.jpg 500X638\RA5366.jpg 74043 RA5366_1.jpg 500X638\RA5366_1.jpg 78114 RA5366_3.jpg 500X638\RA5366_3.jpg Send A Hint! 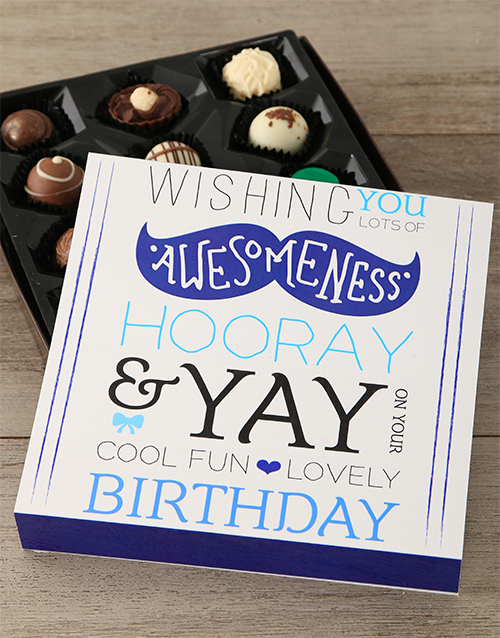 Product Description: less text Send birthday wishes of Awesomeness, Hooray & Yay to a loved one or friend on their special day with this amazing box of chocs with its quirky design of birthday wishes. This box is filled with 12 delicious, assorted Belgian chocolates. Spoil someone with something that conveys fun and lovely birthday wishes and something they can munch on. Get this Birthday Wishes Chocolate Box delivered with NetFlorist.